Today we decided to visit the neighbouring ski area of Ski-Welt. 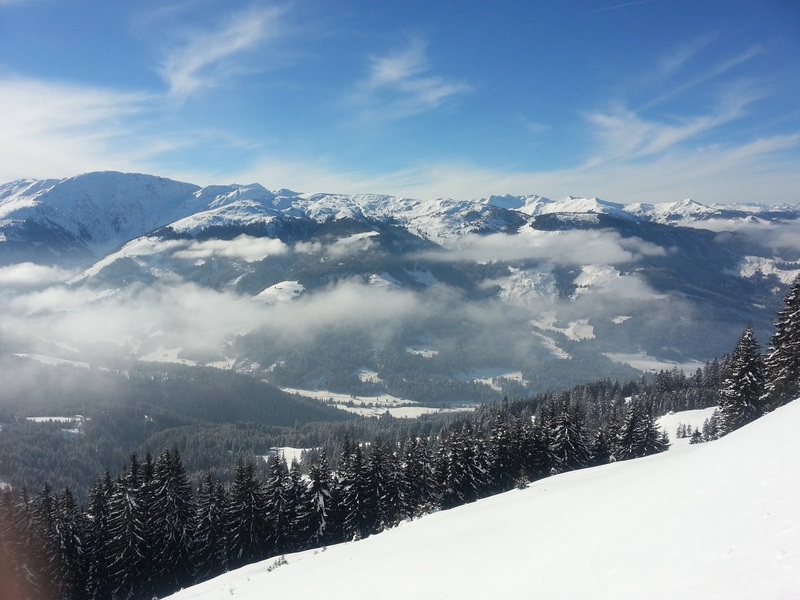 Mainly the areas above Westendorf and Brixen. It’s not entirely linked with ski lifts and involved some vehicular assistance. We started by taking the Hahnenkamm lift at 10am followed by the Steinbergkogel lift. From there we could ski all the way to the valley floor at Pengelstein, a long run. From here we needed a bus and were just checking the timetable when it turned up. Stroke of luck! It was just 3 minutes up the valley to the Ki-West lift, pronounced Key West. This took us straight up into the Ski-Welt area. Lots to go at but we just skied the Westendorf runs and the one down to Brixen. Found a nice little mountain restaurant for light refreshments sitting outside in the sunshine for a few minutes. Here’s a few phone photos. No proper photos as I didn’t carry my Mamiya 7 camera today. We made it to Brixen by 2.45pm and needed a ski bus back to Kitzbuhel. Unfortunately, the next one wasn’t until 4.30pm. Linking neighbouring ski areas clearly isn’t that important to them despite the marketing claims! We are not that patient so we splashed a few Euros and took a taxi to the next village of Kirchberg which is part of the Kitzbuhel ski area. It was a long lift from Kirchberg but it took us right to the top so that we could ski down the other side to Kitzbuhel. We took our skis off at 4.15pm just by the Hahnenkamm lift where we started. What a great day of skiing! Gps showed that we had travelled 39 miles. Another easy day! These sorts of ski days where you travel around several ski areas used to be called ski safaris, maybe they still are. It was a jolly good day though, whatever you call it.